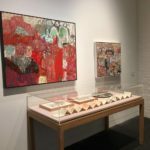 In a lifetime devoted to art making art Elisabeth Cummings is being celebrated with a retrospective exhibition that features a selection of sixty paintings, prints and ceramics from her opus of the past fifty years. After her love of painting was first discovered in children’s art classes run by the painter Vida Lahey in Brisbane, Cummings went on to study at the National Art School in Sydney from 1953-57. 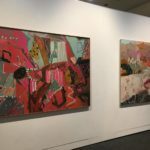 Formative influences included her teachers Lyndon Dadswell, and Godfrey Miller and exhibitions of interior paintings by Grace Cossington Smith and abstracts of Ralph Balson. The talented young artist won the NSW Travelling Art Scholarship in 1958 and headed overseas to Italy where she based herself in Florence, studying and painting in Europe for a decade before returning to live in Sydney. 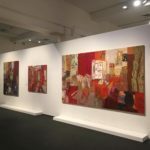 As an inveterate traveller she has studied the work of many artists in museums abroad, first absorbing the influence of the European painters Bonnard and Vuillard, Cezanne and Matisse and later the work of the Abstract Expressionist painters notably Willem de Kooning and Ashile Gorky in America and later Frank Auerbach in London. 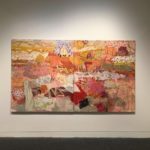 On her return she grounded herself in the bush, building a studio at Wedderburn in 1971 and reconnecting with her interest in painting by her contemporaries, Aboriginal artists and the philosophy and work of Ian Fairweather. 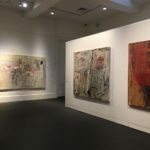 The retrospective exhibition will include a range of subject matter; abstracts, landscapes, still lifes and studio interiors, especially those painted at her studio at Wedderburn on the outskirts of Sydney. 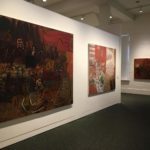 Printmaking has also been important for Cummings and she has worked in monoprinting and etching, collaborating with master printer Michael Kempson Cicada Press at the University of NSW for a decade. The exhibition will coincide with the launch of a full colour monograph on her work with an introduction by John McDonald, preface by Terence Maloon, Director ANU Drill Hall Gallery and appreciations by a range of writers, Michael Kempson, Anna Johnson, Guy Warren, plus an interview with the artist by Sioux Garside, the independent curator of the retrospective. The exhibition is being toured by the Drill Hall Gallery ANU Canberra. Elisabeth Cummings is represented by King Street Gallery on William. Master printmaker Michael Kempson of Cicada Press has worked with Elisabeth Cummings for over a decade and join us to discuss her print oeuvre.